Portability – With its small form factor, battery operation, large built-in LCD screen and intuitive full touchscreen menu system, the TS3 puts the power of a traditional high speed camera in the palm of your hand. High-Resolution, High-Speed Images – The TS3 records ultra-sharp 1280 x 1024 mono or vivid color images at over 510 frames per second. 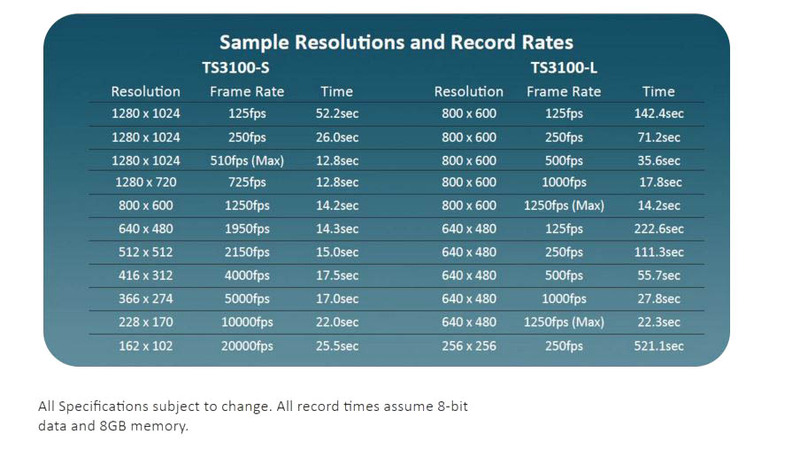 With recording rates in excess of 60,000 frames per second at reduced resolutions, almost no event is too fast for the TS3. 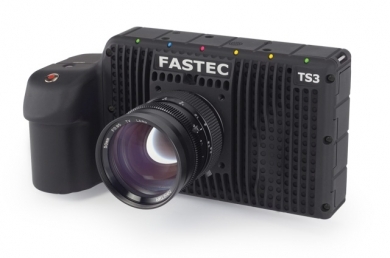 Flexible Control – The TS3 can be operated as a self-contained, handheld camera, or controlled over Gigabit Ethernet via Fastec FasMotion software on your PC/Mac or via the built-in web interface with your favorite web browser on your PC, Mac, tablet, or even your smartphone. FasFire Mode – Ultra-fast save times to an SSD or SD card while recording high-speed bursts of hundreds or even thousands of images at a time, the TS3 is always ready for the next high-speed snapshot! Multiple Storage Options -The TS3 features both a USB port and an SD port for quick and easy image downloads to USB flash drives, SD cards, or portable hard drives. An optional built-in SSD (solid state drive) provides for up to 512GB of lightning-fast non-volatile internal storage. Shoot all day long without having to download to a computer. High-Performance Image Transfer -With download rates of about 8GB per minute to the optional internal SSD, or just seconds for short clips, you will always be ready to take the next shot with the TS3! The FasMotion application makes workflow a breeze with transfers of uncompressed images via Gigabit Ethernet at rates of 50-80MB/s to moderately equipped PCs.